The nip in the air must be responsible for all the sausage questions we've been getting. Always eager to please our readers, here comes some sausage lore. Sausages come in all shapes and sizes, and nearly every culture has several versions. More than likely, sausage was invented as a way to preserve meat. It's a lot easier to preserve small, uniform packages of meat than to preserve large chunks of it. Sausage meat is chopped or ground, mixed with seasonings, and sometimes other things, and then stuffed into casings. I can't think of a vegetarian version of sausage, although boudin comes close, being mostly rice. Sausage is then preserved by smoking it. Some people used to preserved sausage by immersing it in rendered lard, but that method has fallen out of favor with the cholesterol police. Most of the sausage you buy today is fully cooked. All it needs is a little warming. Be sure your package of sausage says "fully cooked" before you dig in just to be on the safe side. 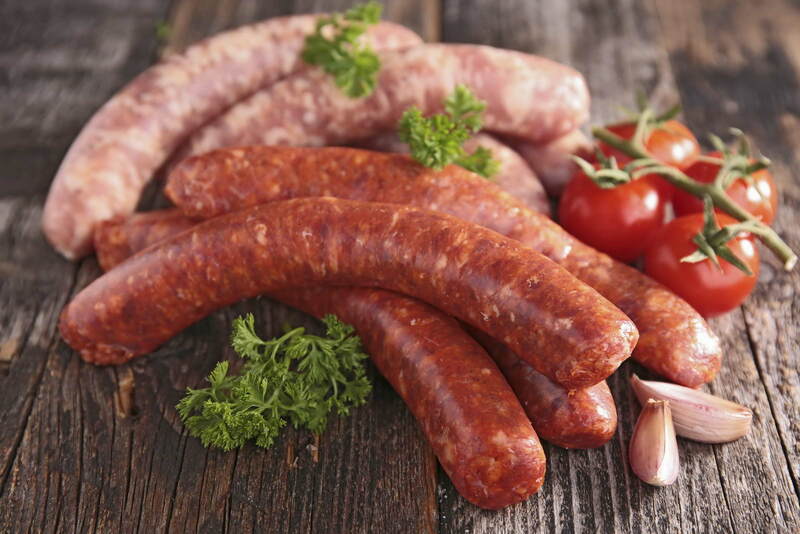 Sausage came to Texas with the German and Czech immigrants and remains a staple on the tables of their descendants. However, the Tex-Mex version, chorizo, has its roots in Spain and could well have been the first Texas sausage. The deer hunters render a lot of Bambi's relatives into sausage. Bambi usually ends up sharing his casing with relatives of Porky Pig. The combination of venison and pork makes a wonderful sausage. The casing into which the sausage is tightly packed is the cleaned intestine from hogs or cattle. Some of the commercial sausage producers use a man-made casing. The one disadvantage of the man-made casing is that it will not fry up crisp like the natural casing. Pan sausage is sausage that has not been stuffed into a casing. My generation of Texans prefers country sausage, that is, sausage that has been made by an individual rather than by a commercial operation. The problem I see with commercial sausage is that in this age of not wanting to offend anybody, the production line sausages tend to be rather bland. Sausage Bundt Cake recipe - DELICIOUS! Texas Hot Guts would bring tears of joy to your eyes and clean out the most clogged up sinuses. Not on the bland list were the good, old-time Texas Hot Guts. Many a person has fond memories of the hotter-than-blazes, grease-squirting morsels that were found at most barbecue joints. The hot guts were pork sausage with a high fat to lean content, seasoned with the usual garlic, salt, and black pepper, but boosted with a lot of fiery hot cayenne flecks throughout the mix. They would bring tears of joy to your eyes and clean out the most clogged up sinuses. If you didn't break the casing before you bit into one, it would squirt a stream of hot grease all the way across the table. The hot guts were cooked in a special smoking chamber on most pits until they wrinkled. That's how you could tell if they were done. If your hot gut ain't wrinkled, it ain't done. Making sausage is one of your more labor-intensive projects. In the old days, it was done as a part of the ritual fall "hog killin'". Neighbors would get together to share the labor, as well as the rewards, of the day. You can make very good sausage in your own kitchen if you like. There are many books available on the subject. You will need something to grind the sausage, a big container to mix it in, and a tool to stuff the meat into the casing. This can be accomplished with a funnel and a stick, but it's slow going. Your butcher can supply you with casing that has been cleaned and only needs a good rinsing in cold water before use. One word of caution: When making sausage you need to keep the meat cold at all times. If it gets above 40F degrees, all kinds of bad things can happen. This means that you keep it in the fridge as much as possible, and you may have to stop and re-chill the meat from time to time if it begins to get warm. These are basic recipes that will give you a place to start. You will probably want to adjust the seasonings to suit your taste. Make a small amount with the basic recipe and then you can personalize it to perfection. Here's your basic sausage making. Mix seasonings into ground meat until well incorporated. Stuff into casings. Sausage should be cooked in boiling water until done, and then smoked or fried or however you want to prepare them. Use the Country sausage recipe adding two teaspoons of cayenne. If you can find hot pepper flakes they are even better. These sausages can go directly into the smoker without precooking them, but be sure they are wrinkled before you serve them. Mix seasonings into ground meat until well incorporated. Stuff into casings. Note, Fiesta brands has a great packaged chorizo seasoning. Use equal parts lean venison and 50/50 pork mix, and use the country sausage seasonings here. Here's a favorite of mine from the Cajun folks over in East Texas and Louisiana. Simmer, covered, the meat and liver with the onion, bell pepper, celery and garlic until meat falls apart. Remove meat, strain the broth, and discard the vegetables. Grind and mix together the meat, chopped onion, green onions and parsley. Mix with reserved green onion, parsley and rice. Add enough reserved broth to make damp mixture. Season to taste. (The Cajuns like it very spicy.) Stuff into casings. All ingredients are cooked so you need only to warm the boudin. You can pan fry it, or poach it. I prefer it slow smoked on the grill. This is a whole meal deal: meat, vegetables and cereal all in one neat package.